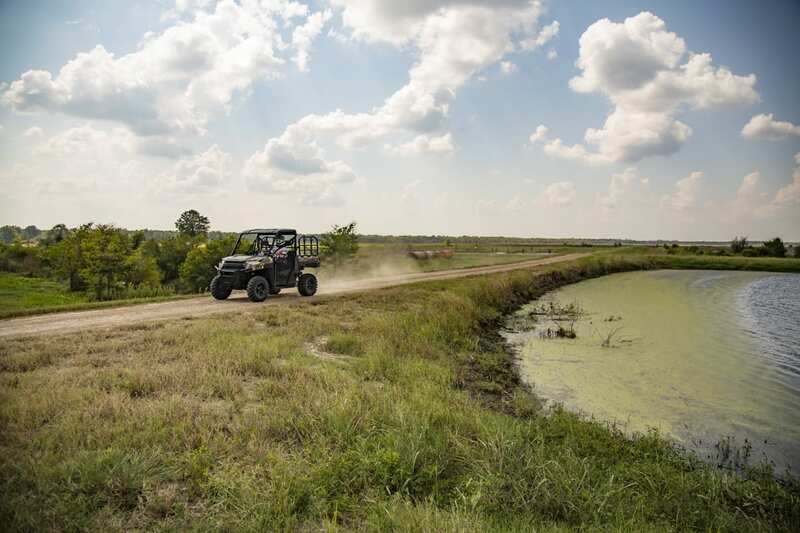 It’s no secret to anyone that Polaris holds the market share of the utility UTV market with the Ranger lineup, and it’s with good reason. 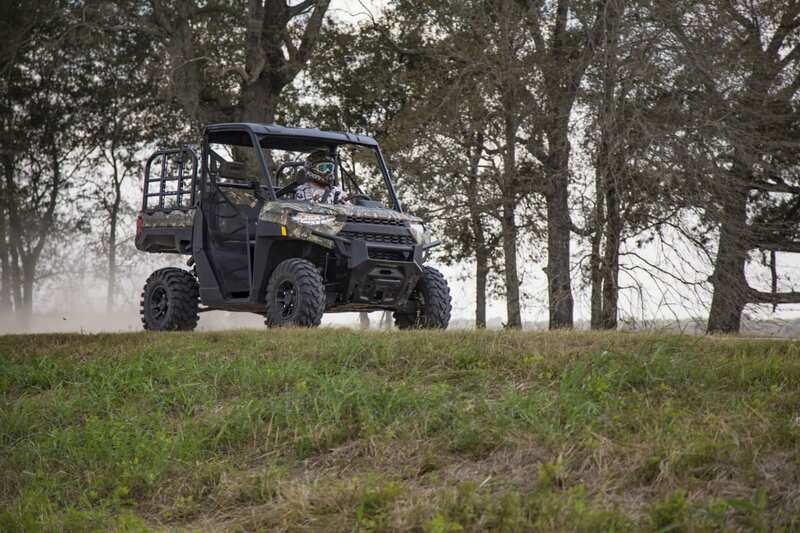 The Ranger series has a wide range of machines that fit just about every need and price point. 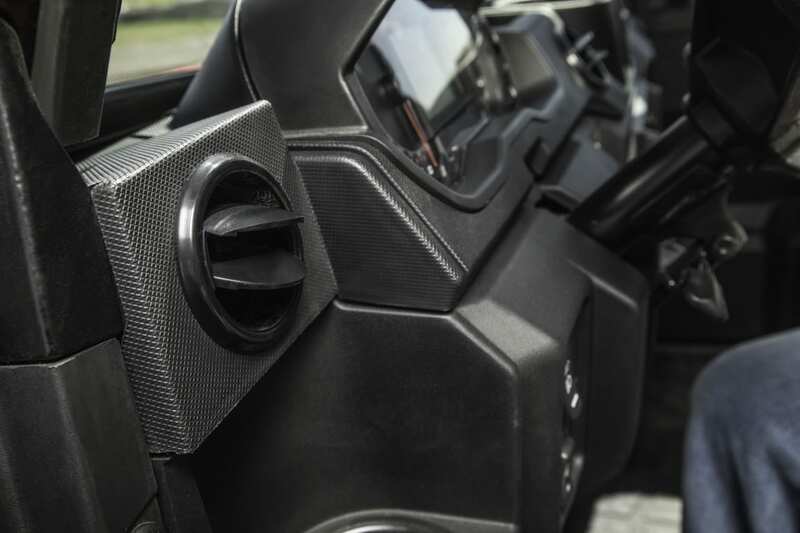 When Can-Am released the Defender a couple of years ago, it was a shot across the bow of the mighty Polaris ship. 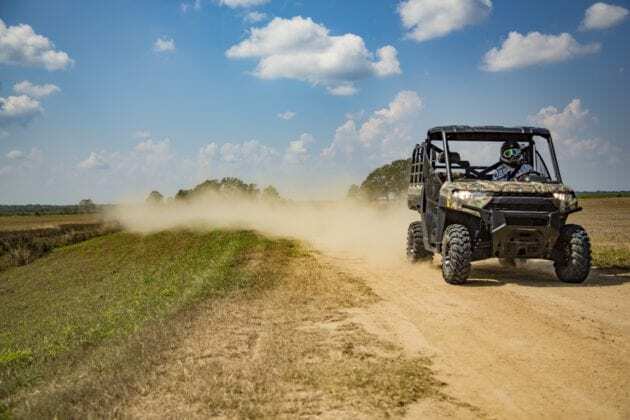 These two ultra-competitive companies were already battling it out on the sport segment, and the Defender one-up the Ranger with inclusion of the first 1,000-class machine in the HD10. 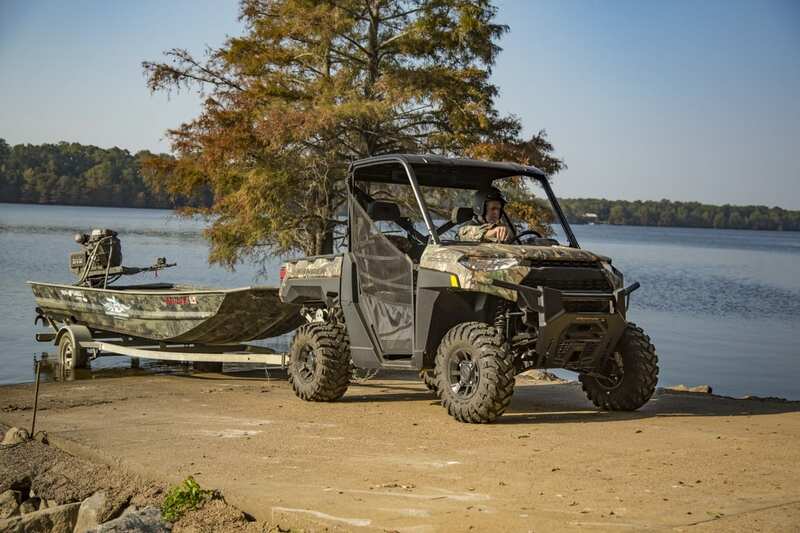 Polaris responded last year with the Ranger 1000, a machine built on the top-selling Ranger 900 platform, with a few changes. This machine did well again the HD10, but Polaris wasn’t done. Just a year later, they unleashed an all-new Ranger platform with the new 2018 Ranger 1000. But wait, wasn’t it new last year? This tactic isn’t truly new for Polaris. Remember the first ACE 900? It was out for not even a full year before it was replaced by the all-new, and much improved ACE 900 XC, a machine we love around here. 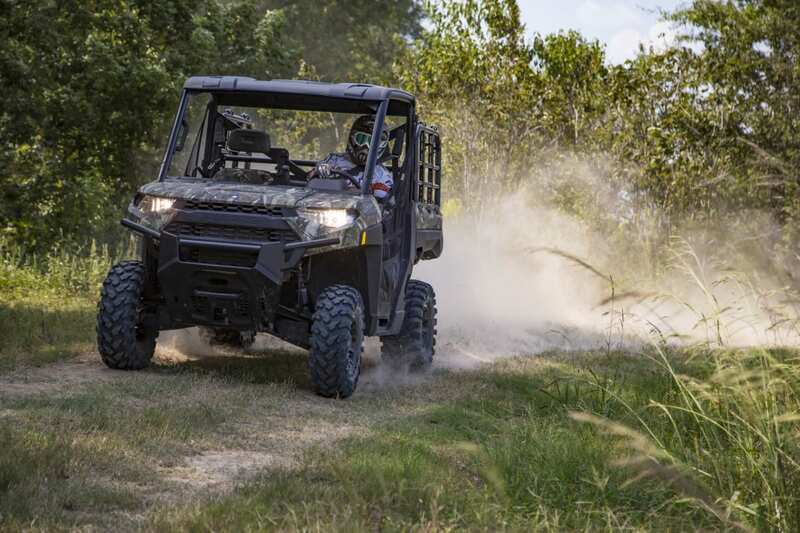 From looking at the new Ranger 1000 platform, it is pretty obvious that Polaris has been planning on an all-new machine for some time. 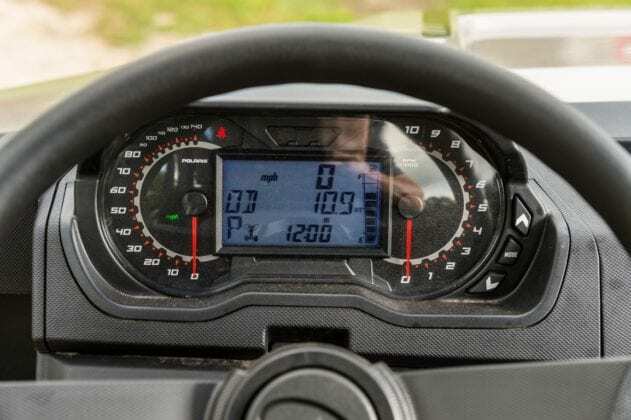 This doesn’t mean that last year’s Ranger 1000 is a bad machine. Not at all. But the new Ranger is at another level of technology and development. As is often the case, the buying public often feels like suggestions for improvements to a product fall on deaf ears. That is not what happened with Polaris, however. They took more that 100 suggestions for improvements to the Ranger platform from owners and used them in the frame-up redesign of a machine that already leads the world in UTV sales. And speaking of the frame – It’s an all-new, one-piece frame design. They achieve the frame design by forming the core frame as a single piece. The result is a more rigid and sturdy frame design. 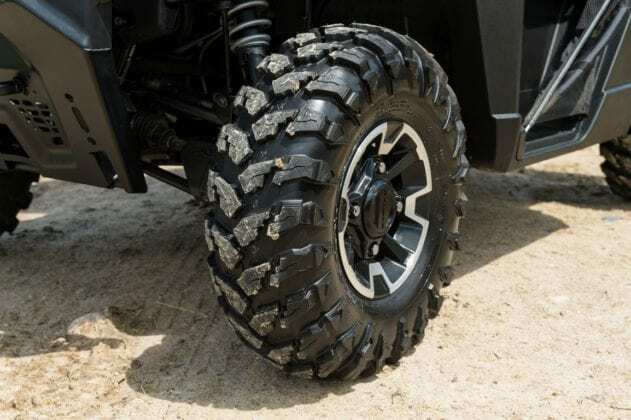 From there, every other piece of the chassis is newly developed to add to the rigidity of the frame, increase ground clearance and add to the capacity of the machine. The suspension also received an upgrade. The travel bumped up to 11-inches and offers up an even smoother ride than the previous buttery-smooth system. We drove the machine on a variety of terrains and found it to be great for slower speeds, just as Rangers are widely known for. The real improvement was at higher speeds. Last year’s Ranger 1000 almost too soft at the higher end of its speed. You’d get a little bit of body roll. While it wasn’t a scary amount, it did have the tendency to tweak our confidence. 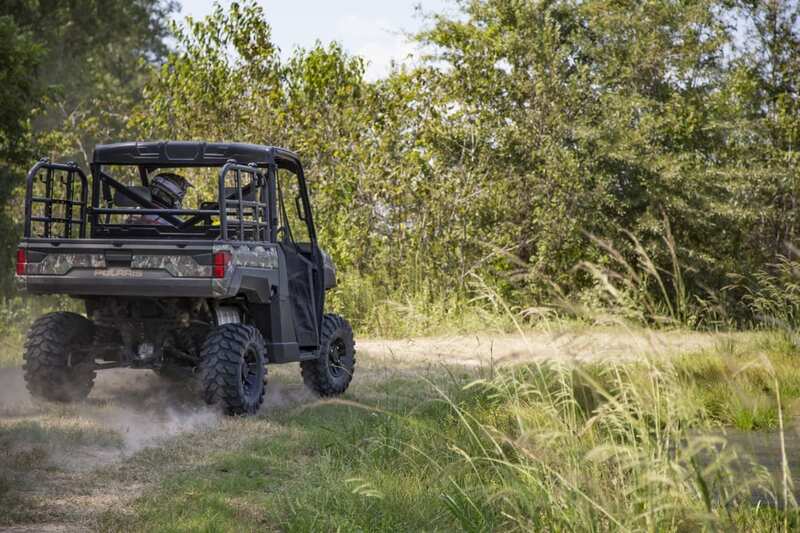 The new Ranger 1000, even with the increased suspension travel and the jump to a full 13-inches of ground clearance, you don’t feel pitched around. Instead the Ranger is firmly planted to terra firma. 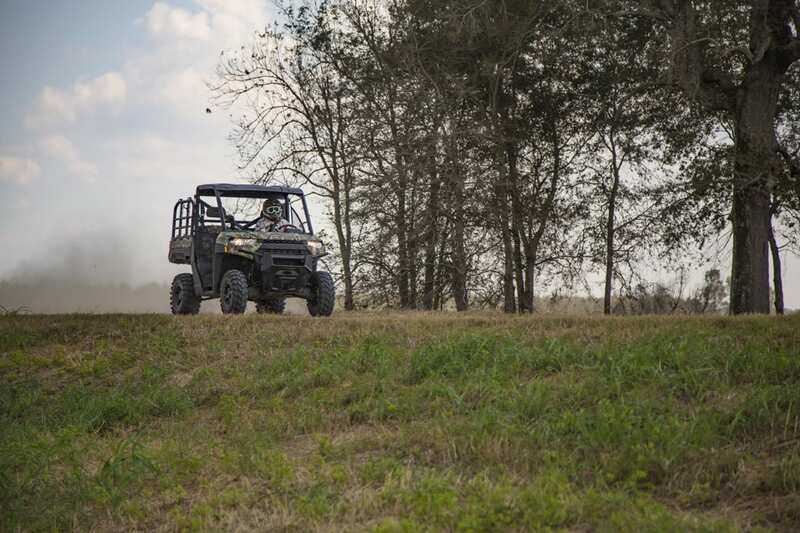 When you drive a 1000-class UTV, be it a sport, or a recreational/utility machine, you expect a certain characteristic of the power delivery – a solid high-end rush. For a utility-based machine, like the Ranger, you want that power to come on strong in the low end. 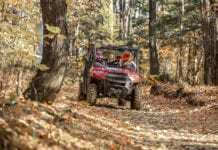 Polaris looked at the clutching on the Ranger and improved an already great engine. The new motor pumps out 82 horsepower with a mean low-end power delivery and a fun and respectable high end and mid-range. This is the most fun Ranger we’ve ever driven. To go along with the improved clutching, Polaris redesigned the air intakes to help the engine run cooler and breath better. They’ve also retooled the CVT belt for durability. They claim it is the strongest belt ever in a Ranger vehicle. Time will tell, but they’ve obviously done their homework. With the new frame, suspension and engine work, there are some serious boosts to what the Ranger can do when it’s time to go to work. 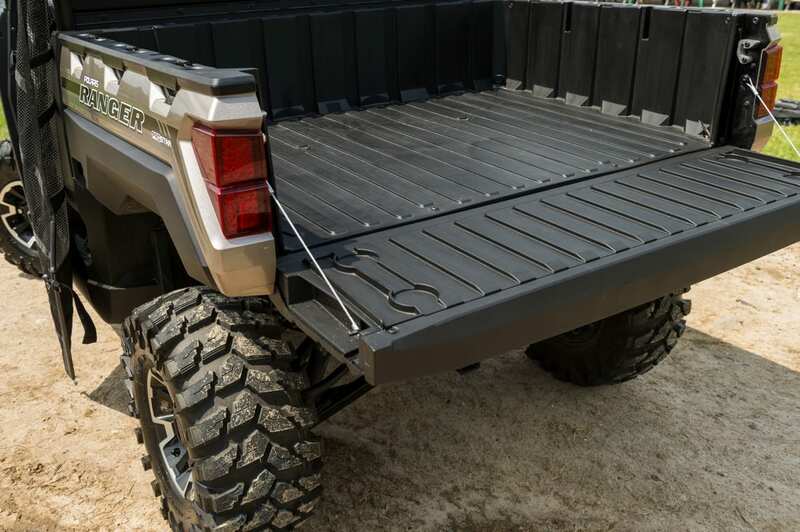 For starters, the all-new cargo box got an 11.5-percent boost in overall volume. The corners are now all welded steel and the cargo-management points have all been retooled to be more versatile. And what about capacity? The new Ranger can carry up to 1,500 pounds in the cargo bed now. That’s a 50-percent increase over last year’s model! Want to tow something with the 2-inch receiver integrated into the new frame? It can tow up to 2,500 pounds now, too. 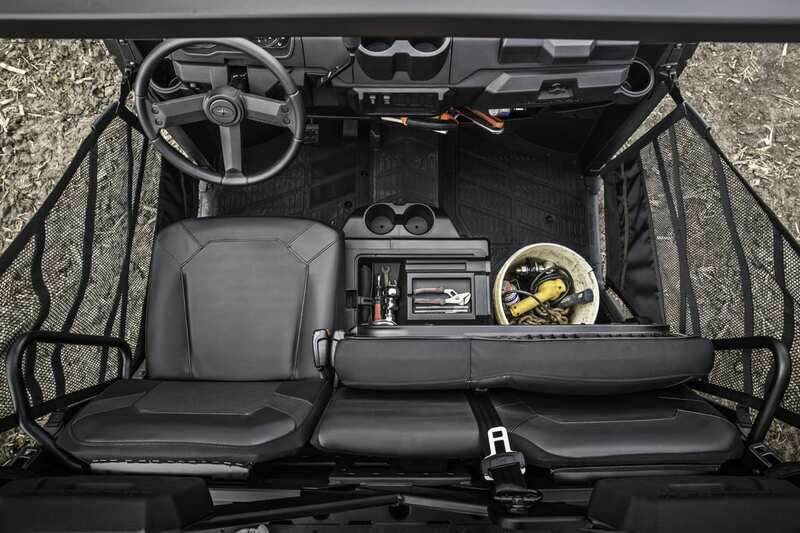 The interior of the Ranger was completely overhauled, too. They relocated the ROPS slightly and looked at ingress and egress, giving the already easy-to-get-in-and-out Ranger even more room. The seats have an inch more padding in the lower seat, making them extremely comfortable. The passenger seat flips up for additional storage options and there is now a dual-level glove box for additional storage and a large tray area for your stuff built into the dash. Even the cup holders were redesigned with handle cutouts for mugs! 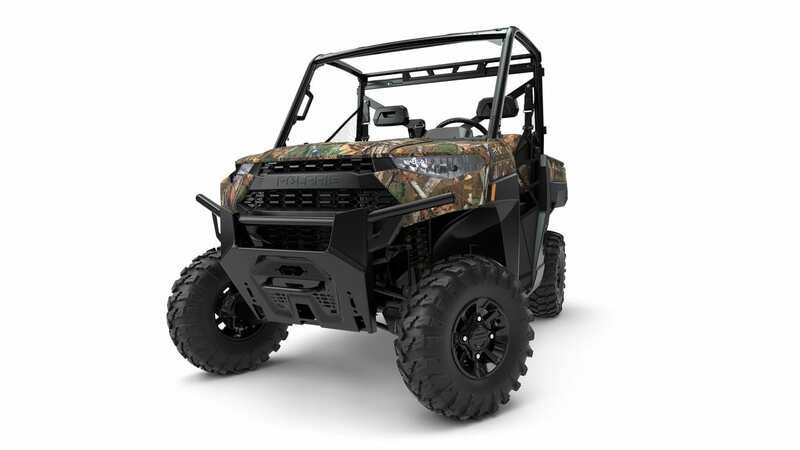 Now, you’d have to be not paying attention to have not noticed that Polaris completely redesigned the appearance of the Ranger 1000. It’s a bit polarizing as people either love the truck-inspired design, or they hate it. We fall on the love it side. It’s not just the body work that adds to the appeal, either. The new front bumper looks far more intense than before and obviously provides more protection. The new 27-inch Maxxis tires add to the aggressive stance and provide great traction too. Our unit is also decked out in Polaris’ own pursuit camo pattern. 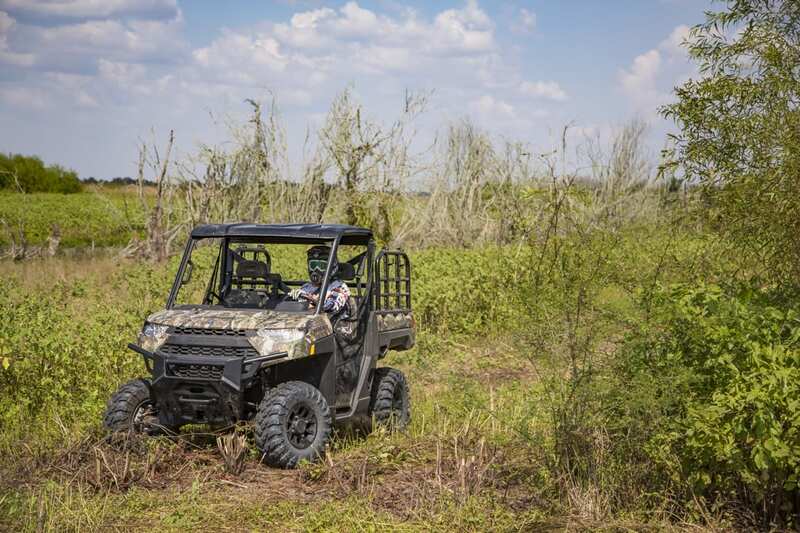 It used to be that camo UTVs were always covered in one of the major camo license patterns like Realtree. Now more and more companies are creating proprietary patterns. With Polaris, one of the graphic artists at the corporate office went out behind the building and gathered some leaves and branches and used that as inspiration to create the Pursuit pattern. We’re not alone in saying that we love this pattern and wish Polaris licensed it for more hunting clothing options. Are you listening, Polaris? We want more camo! When we did our first walk-around of the new Ranger, we noticed all the new features and appreciated the time and design that went into the new machine. There were a few things we were concerned about carrying over from the previous Ranger XP 1000. Now, we’re not dogging on that machine, mind you. We were big fans, but there were a few quirks that we hoped didn’t carry over. The biggest was the steering. Last year’s Ranger had steering that felt lagging. You really had to crank on the wheel to get the Ranger to turn. No more! 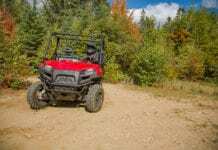 Polaris tightened up the steering system and reduced the steering ratio. This also results in a tighter turning radius, so handling is improved. A new front sway bar makes the handling very solid too, creating even better feel on the steering wheel. 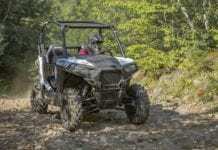 Polaris also retained the three-position throttle system with the new Ranger. We threw it in Work Mode and low range to try towing about 1,000 pounds of trailer and hay bale and noticed how smooth and controllable the power delivery was. This makes doing tasks very controllable with the Ranger, even more so than the previous model. We put it into Performance Mode for some trail riding and really enjoyed the improved control, ride quality and stability of the new, stiffer frame. Polaris really touted their advancements in functional utility for the new Ranger, but those changes were equally impressive on the recreational side of the machine as well. 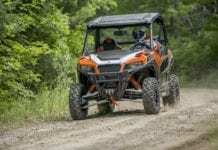 Rangers have always been trail capable, but the new 1000 is the most capable one yet from the Minnesota-based company. 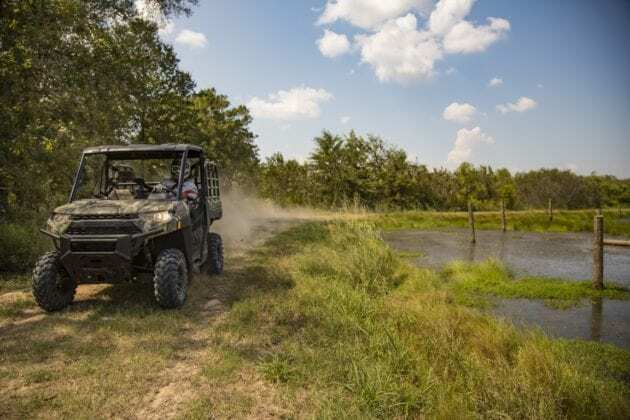 If you’re in the market for a new utility/recreation UTV and want the most power and capability, it’s hard to overlook the 2018 Polaris Ranger XP 1000 EPS. With the new frame, increased ground clearance and list of other improvements that reads like a wish list for an off-roader, the newest Ranger is the best yet by far.